Tripping and Slipping Sandharv Dept of Transport. CA 2004 - highway authorities have no common law duty to grit roads. But academic now, because from 31 Oct 2003 there is a statutory duty under the Railways and Transport Safety Act 2003. 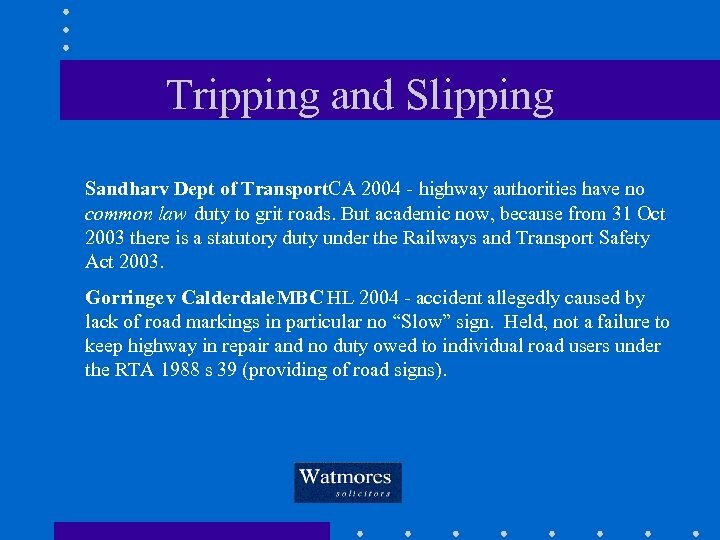 Gorringe v Calderdale MBC HL 2004 - accident allegedly caused by lack of road markings in particular no “Slow” sign. Held, not a failure to keep highway in repair and no duty owed to individual road users under the RTA 1988 s 39 (providing of road signs). 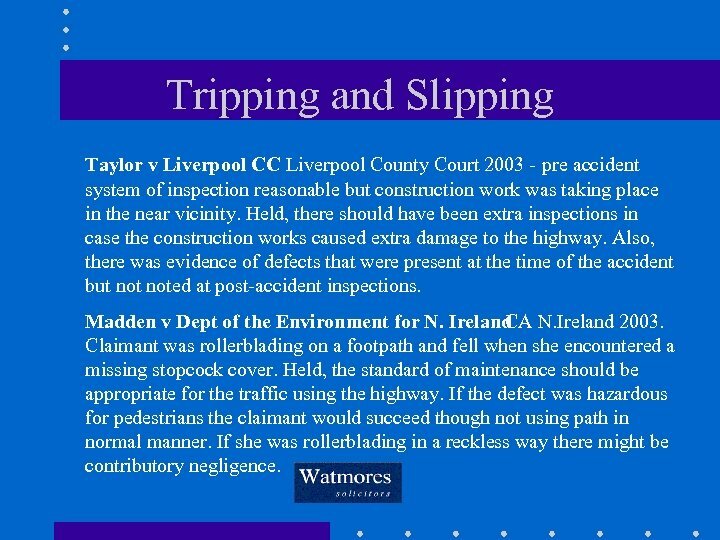 Tripping and Slipping Taylor v Liverpool CC Liverpool County Court 2003 - pre accident system of inspection reasonable but construction work was taking place in the near vicinity. Held, there should have been extra inspections in case the construction works caused extra damage to the highway. Also, there was evidence of defects that were present at the time of the accident but noted at post-accident inspections. Madden v Dept of the Environment for N. Ireland 2003. CA Claimant was rollerblading on a footpath and fell when she encountered a missing stopcock cover. Held, the standard of maintenance should be appropriate for the traffic using the highway. If the defect was hazardous for pedestrians the claimant would succeed though not using path in normal manner. If she was rollerblading in a reckless way there might be contributory negligence. 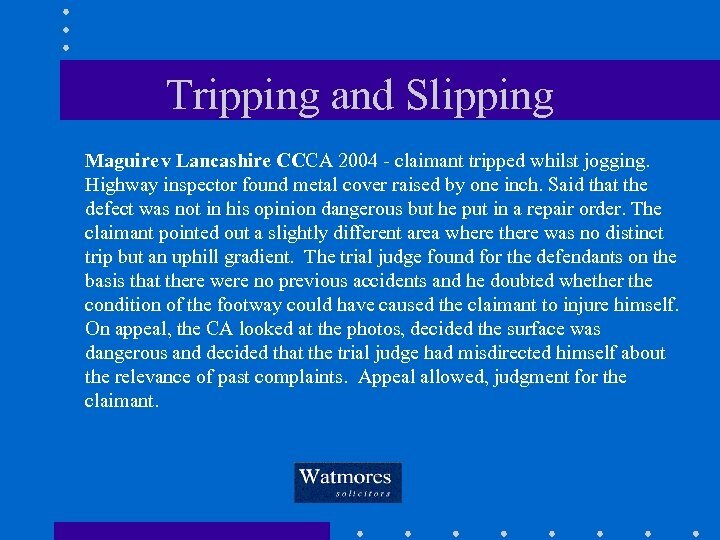 Tripping and Slipping Maguire v Lancashire CCCA 2004 - claimant tripped whilst jogging. Highway inspector found metal cover raised by one inch. Said that the defect was not in his opinion dangerous but he put in a repair order. The claimant pointed out a slightly different area where there was no distinct trip but an uphill gradient. The trial judge found for the defendants on the basis that there were no previous accidents and he doubted whether the condition of the footway could have caused the claimant to injure himself. On appeal, the CA looked at the photos, decided the surface was dangerous and decided that the trial judge had misdirected himself about the relevance of past complaints. Appeal allowed, judgment for the claimant. 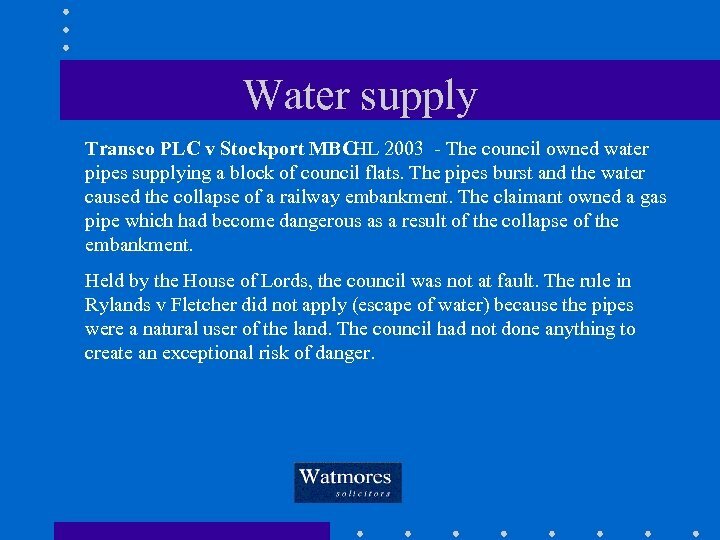 Water supply Transco PLC v Stockport MBCHL 2003 - The council owned water pipes supplying a block of council flats. The pipes burst and the water caused the collapse of a railway embankment. The claimant owned a gas pipe which had become dangerous as a result of the collapse of the embankment. Held by the House of Lords, the council was not at fault. The rule in Rylands v Fletcher did not apply (escape of water) because the pipes were a natural user of the land. The council had not done anything to create an exceptional risk of danger. Employment R v East Sussex CC QBD 2003 - two sisters were severely disabled and were cared for at home by Council carers. The court considered how the Manual Handling Regs should be applied. Held, a balance should be struck between the rights of the sisters (including the rights of the disabled to participate in community life) and the rights of their carers. It was for the Council now to devise a suitable policy and protocol taking all these matters into account. Fytche v Wincanton Logistics Plc HL 2004 - claimant suffered frostbite to his toes because his boot (with steel toecaps) leaked water. Held, for there to be a breach of the PPE at Work Regs, the disrepair must be relevant to the purpose of the boots. They were to protect from impact, not to protect from water. He did not have any duties which required the boots to be waterproof. Claim dismissed. Employment Hammond v Commissioner of Police CA 2004 - claimant, a vehicle mechanic, was injured when trying to remove a bolt from a wheel and the bolt sheared off. Held, the definition of “equipment” under the Provision and Use of Work Equipment Regs 1992, did not include the bolt as distinct from the tools he was using. Doherty v Rugby Joinery. CA 2004 - vibration white finger, held that in the woodworking industry the defendants ought by 1991/2 to have questioned their employees to identify which were developing symptoms of VWF. Employment Barber v Somerset CC, HL 2004 - Workplace stress. Teacher with excessive workload. At first instance judgment for the claimant. The CA reversed that finding. The HL said there were insufficient grounds for overruling the original finding of the trial judge. Great weight was given to the claimant’s three week absence with stress and depression after which no additional steps had been taken by the employer to reduce the pressure of his work. Hyam v Havering PCT, High. Court 2004 - workplace stress/bullying. Claimant regularly complained that he was being asked to carry out demeaning tasks that were outside the normal scope of his job description. Eventually walked out and diagnosed with depression and anxiety. Held, he was an obstructive and difficult individual and the employer had not been in breach of duty. 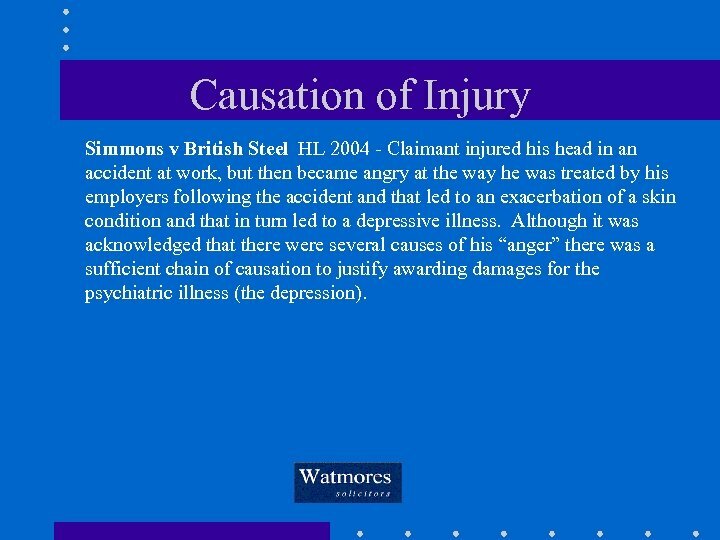 Causation of Injury Simmons v British Steel HL 2004 - Claimant injured his head in an accident at work, but then became angry at the way he was treated by his employers following the accident and that led to an exacerbation of a skin condition and that in turn led to a depressive illness. Although it was acknowledged that there were several causes of his “anger” there was a sufficient chain of causation to justify awarding damages for the psychiatric illness (the depression). 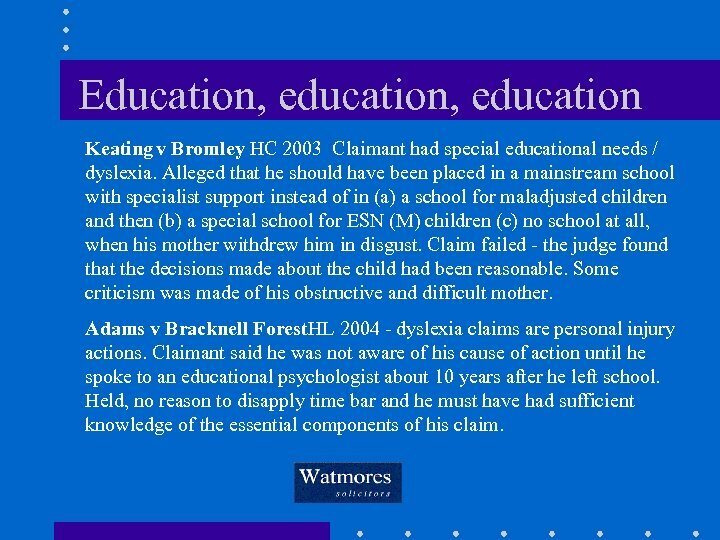 Education, education Keating v Bromley HC 2003 Claimant had special educational needs / dyslexia. Alleged that he should have been placed in a mainstream school with specialist support instead of in (a) a school for maladjusted children and then (b) a special school for ESN (M) children (c) no school at all, when his mother withdrew him in disgust. Claim failed - the judge found that the decisions made about the child had been reasonable. Some criticism was made of his obstructive and difficult mother. Adams v Bracknell Forest. HL 2004 - dyslexia claims are personal injury actions. Claimant said he was not aware of his cause of action until he spoke to an educational psychologist about 10 years after he left school. Held, no reason to disapply time bar and he must have had sufficient knowledge of the essential components of his claim. 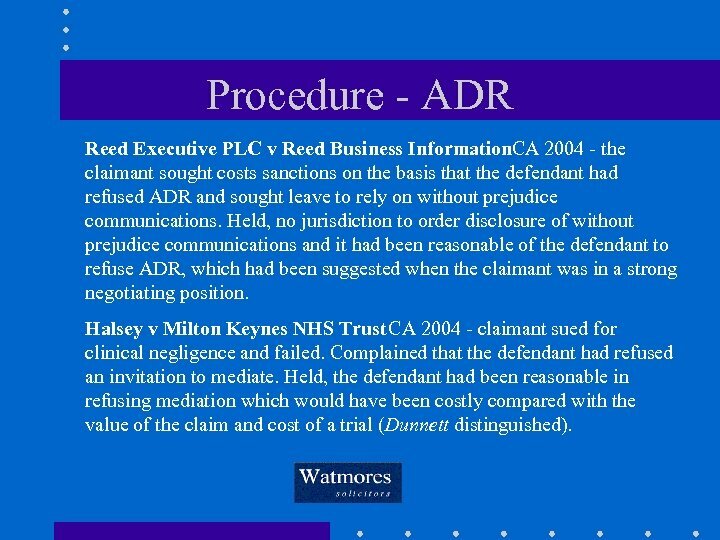 Procedure - ADR Reed Executive PLC v Reed Business Information. CA 2004 - the claimant sought costs sanctions on the basis that the defendant had refused ADR and sought leave to rely on without prejudice communications. Held, no jurisdiction to order disclosure of without prejudice communications and it had been reasonable of the defendant to refuse ADR, which had been suggested when the claimant was in a strong negotiating position. Halsey v Milton Keynes NHS Trust CA 2004 - claimant sued for clinical negligence and failed. 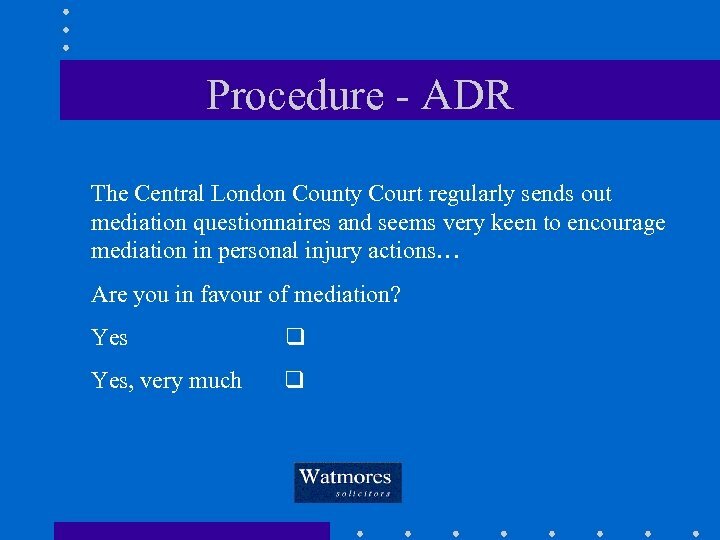 Complained that the defendant had refused an invitation to mediate. Held, the defendant had been reasonable in refusing mediation which would have been costly compared with the value of the claim and cost of a trial (Dunnett distinguished). 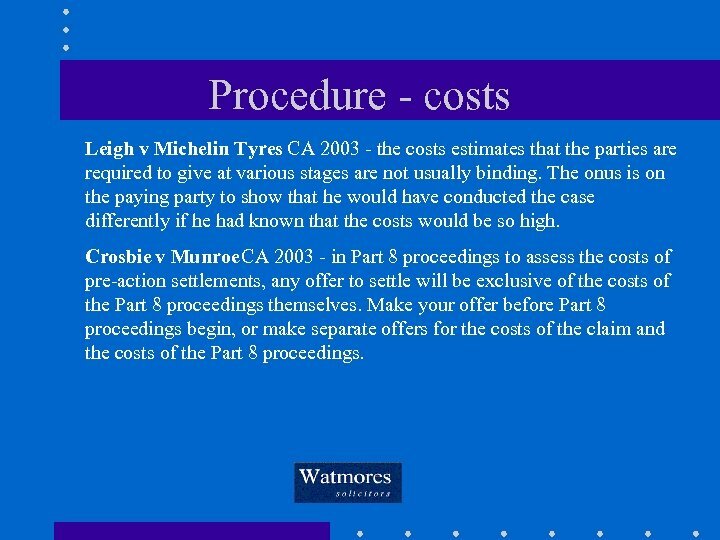 Procedure - costs Leigh v Michelin Tyres CA 2003 - the costs estimates that the parties are required to give at various stages are not usually binding. The onus is on the paying party to show that he would have conducted the case differently if he had known that the costs would be so high. Crosbie v Munroe CA 2003 - in Part 8 proceedings to assess the costs of pre-action settlements, any offer to settle will be exclusive of the costs of the Part 8 proceedings themselves. Make your offer before Part 8 proceedings begin, or make separate offers for the costs of the claim and the costs of the Part 8 proceedings. 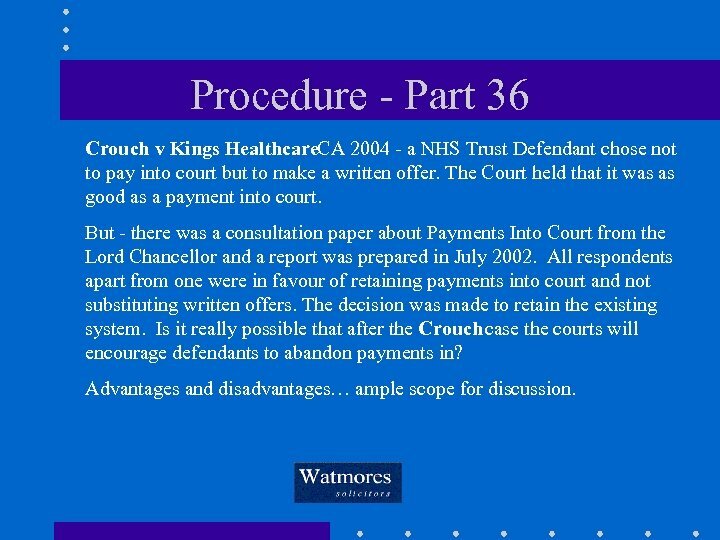 Procedure - Part 36 Crouch v Kings Healthcare. CA 2004 - a NHS Trust Defendant chose not to pay into court but to make a written offer. The Court held that it was as good as a payment into court. 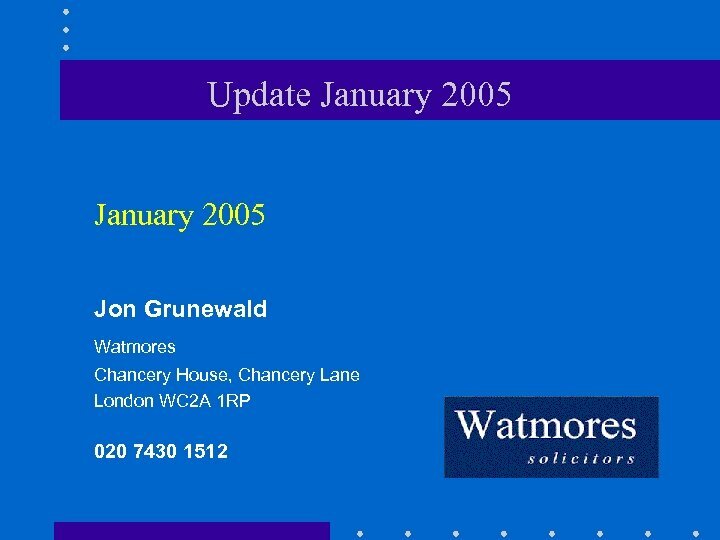 But - there was a consultation paper about Payments Into Court from the Lord Chancellor and a report was prepared in July 2002. All respondents apart from one were in favour of retaining payments into court and not substituting written offers. The decision was made to retain the existing system. Is it really possible that after the Crouch case the courts will encourage defendants to abandon payments in? Advantages and disadvantages… ample scope for discussion. 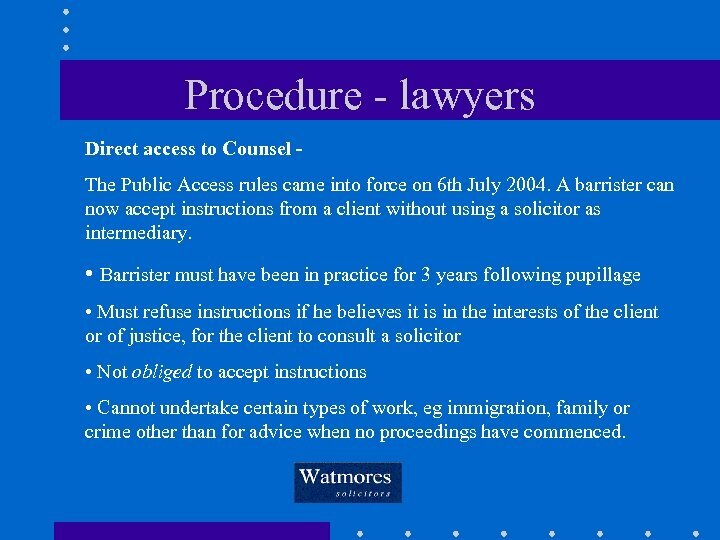 Procedure - lawyers Direct access to Counsel The Public Access rules came into force on 6 th July 2004. A barrister can now accept instructions from a client without using a solicitor as intermediary. • Barrister must have been in practice for 3 years following pupillage • Must refuse instructions if he believes it is in the interests of the client or of justice, for the client to consult a solicitor • Not obliged to accept instructions • Cannot undertake certain types of work, eg immigration, family or crime other than for advice when no proceedings have commenced.